"Just wait to attack until you see the whites of their eyes." "But spiders don't have white in their eyes." Tom and Adam were unable to make it to Conquest of Frey Game 10, so their Characters (Sayer and Valgard) were controlled by Jeff and JADE Guest Steve respectively. Last game, the party found themselves in a Dungeon on top of a giant Octopus' back. 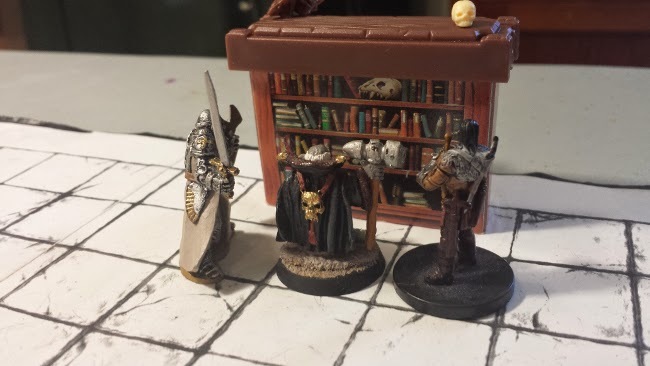 A battle with shadows had turned them away from the main chamber and they ran through one of the side doors, ending up in a library with locking doors. Seeing it as a place of refuge, the group sealed themselves in and rested for the night. And the Octopus had Submerged, so there was no way out! In Conquest of Frey Game 9, Sayer had brought eight men with him over to the Island on the octopus, but of those, only four had made it to the shore, and of those four, three were still alive. Dave, our DM, let us turn those the three survivors into 5th level fighters, and re-name them: Jaird was our muscle, he would preform all of the manual labour needed. Chauncey "The Chaunce" Williams was the trio's fighter, and Lorenza was the Archer. 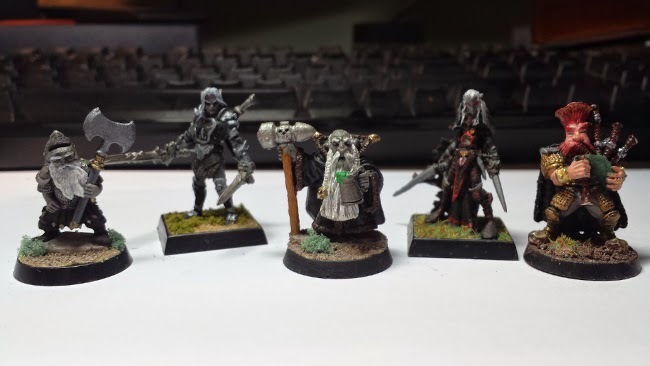 With the party established, the group began by waking, studying their spells and eating the few scraps of food they could find. Scene 1 The Room. The Trap Door. The Pit. After Finishing his studies for the morning, Dwannis took another look around the room. He had searched it the night before and found nothing, but was afraid that in his excited state he had missed something. It turned out he was right. One of the shelves against the wall had a book containing a very powerful spell, but he was not tall enough to reach it! Embarrassed, but not enough to deter him, Dwannis summoned Jaird to help him, and Chauncey followed, amused by the scene. Jaird pulled the book form the shelf, but it wasn't a book, it was a hidden lever! A trap door opened under Dwannis, Jaird and Chauncey's feet, and they slipped away into the darkness. After a short fall, Dwannis called out that the three were alright and in a room with two gated doors. He had Jaird and Chauncey lift the gates and called for the rest of the party to join him. Reluctantly Raskavas, Bodie, Sayer, Valgard and Lorenza jumped into the pit, and followed him through the lifted gate and into the next corridor. Scene 2 A Room Full of Spiders. The tunnels were waist high with filth, but the adventurers paid it no mind and continued down the winding path until they reached a fork. Dwannis charged down the left passage, leading the party to a door at the top of a small stairwell. Dwannis commanded Raskavas to kick down the door, who in turn commanded Jaird. Following his command, the mercenary pounded on the door for almost 10 minutes, creating only a small hole. It was then that Raskavas realized the door was unlocked, and pulled open rather than pushed. Feeling silly, he opened the door revealing a large dark chamber. Being dark folk, each member of the party had 60ft dark-vision, which cut through the shadows and revealed a nest of spider webs that filled the room. The nest was a tight cluster with tunnels leading inside of it. But no spiders were in sight. After a few failed attempts to climb the web -and getting stuck each time- Dwannis decided he would try to burn the web, and launched a fireball at it. The missile struck the web, creating a smoldering patch, but the web did not ignite. The heat and vibrations did however, attract five giant spiders. Not just any Spiders, Phase Spiders. To which Bodie responded "But spiders don't have white in their eyes." "Oh God!" Shouted the party. The Cause Fear spell worked and the Phase Spider recoiled in horror as the other four charged. The battle raged, with Bodie killing one, and Dwannis killing and raising another as a zombie. In the the end, the Phase Spiders were too fast. They kept phasing out to another dimension only to return later and strike from behind. The party had had enough of it, and ran into back into the tunnels, leaving the room behind them. This time, taking the right fork, the party continued through the winding tunnels. The shear size of the place astounded Dwannis. Nothing seemed to control this dungeon, it was as if each room was it's own nest of creatures, who took up residence ages ago. What was this strange place, and how did the monsters get here in the first place? The journey through the tunnels seemed like hours. No one had any idea of how to get out of the catacombs, and the fear that there wasn't a way out grew steadily in the party. The fear and monotony was of the winding journey was broken by a t-section, and the need for a decision. Dwannis flipped one of his gold coins, caught it and slapped it against the back of his hand: heads. They went right. The tunnels to the right were larger then the ones they had been in, and were not full of the muck they had been dredging through for hours. It was a welcome relief. 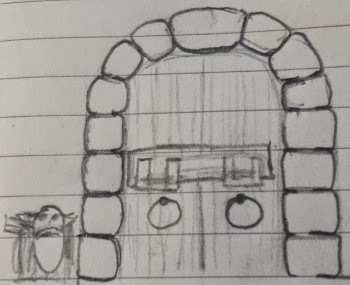 The party followed the tunnels until they reached a large door with a wooden brace on the outside. It took the entire party's strength to lift it, but they removed the beam, and opened the door: before them lay a vast chamber. It was a big locked door. Skulls of giants, and the bones of a thousand creatures litter the floor, broken only by pools of waist high water. A cave yawned from the back wall, large enough to fit a monster. The room had a aura of foreboding. Scene 4 The Hydra's Lair and the Key. 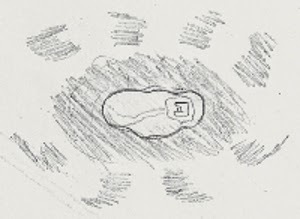 "We discovered a large beast in the dungeon that appears to be guarding a key..."
As the party crossed the centered of the chamber, a roar echoed from the cave, and the ground began to shake as the pounding of heavy foot steps approached. A single Reptilian head appeared from the cave, followed by another, and then another until 9 heads stood before us, all on the back of a single beast: a nine-headed hydra! And it had a key around its neck. 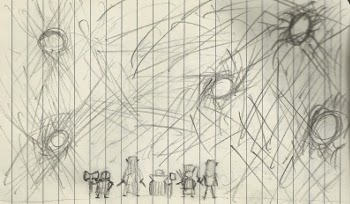 Dwannis immediately summoned a shadow and ordered his Phase Spider to attack, while The rest of the party rushed towards the beast, inspired by the the music from Bodie's bagpipes. The beast fought viciously, each of it's head snapping at the fighters. It lasted for more than and hour, and saw Jaird and Chauncey "The Chaunce" Williams killed, but in the end, the beast lay dead drained of its strength by Dwannis' shadows. He then removed the key from the beast and held it high above his head. We have the key that Aren Bellwick's men sought, and have slain one of the main monsters in this dungeon. Now we need to discover where the key fits, and how to get out of this place. But we will most likely rest here. Our Cleric used all of his healing spells, and Dwannis used most of his spells against the Hydra. Let us hope next round this dungeon reveals its secrets.